Just a hop, skip and a jump off of the Blue Ridge Parkway in Maggie Valley, NC is an American treasure – the Wheels Through Time museum. 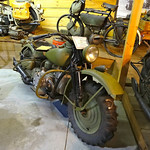 It is home to hundreds of American-made motorcycles, tons of ephemera and historical photographs. Built by the passion of Dale Walksler, a man with encyclopedic knowledge of motorcycles – the museum also bills itself as “the museum that runs.” Though the machines are true museum pieces, they are started and ridden. It is not at all unusual to find Dale riding some beautiful vintage iron through the museum, starting up an antique or laying down a smokey burnout on the museum floor. While we were there, he started up 2 early 1900’s Indians on the floor. When the second one was shut down and the crowd that had gathered started to dispersed he looked directly at me and said, “you look very familiar. You’ve been here before…” and we struck up a conversation about our last visit there back some time in 2006. Now, I don’t know if he says that to all the girls, but… I was tickled pink by the notion that he might remember me. Dale, who struck me as a very kind soul spent some time sitting and talking with us. We talked about motorcycles of course, but also about people and life. He even suggested some great local riding since we were visitors to the area. Truly a nice man. Please support this passion, this time capsule of motorcycle history. Visit Wheels Through Time. You’ll be glad you did. Great pictures Fuzzy. There are truly some awesome machines in the museum. I am glad it is was built and is still owned by such a great man. And of course he remembered you – you are unforgettable are you not? Wow I can’t believe all this cool stuff I skipped when I was down there. I have to plan a trip right away! You said it! Had such a great time I can hardly wait to head back down that way again. I think you could spend a lifetime riding there without getting bored. Lot’s to ride and lot’s to see. Great pictures! Love the fact that he remembered you. Very nice! I hope to visit there myself but you have given us all a taste of the pie! We’ll be in that area (Sans bikes, unfortunately) in September. Can’t wait to check it out!